“A true and exact account” indeed. Letters and diaries present unique challenges for historians. Self-censorship, self-aggrandizement, omissions, and exaggerations pepper their pages. A number of studies have focussed on the act of letter and diary writing and the art of interpreting these sources. Letters and diaries provide tantalizing glimpses into how people lived their lives, bringing details and the odd secret to the fore. But researchers know that these sources more often focus on the quotidian: what the weather was like, what a person had for dinner, when the lilacs bloomed. As a researcher turns the pages, absorbing ordinary detail after ordinary detail, a picture moves into focus: for historians concerned with place and space, letters and journals provide crucial depictions of how places looked, sounded and smelled, and of how individuals interacted with and moved through the landscape. Two years later he would marry Catherine Howley (aunt of the aforementioned Richard) and enter quite happily into her family’s large and extended social circle. Morris’s diary may not contain any salacious tidbits, but it does record, in painstaking detail, the names of everyone he and Catherine met on their daily walk, where they met them, who they entertained, and who entertained them. As years go by, the faces around their table change, supporting characters enter and exit their lives, and the walks shift in route and duration. Why did Edward Morris record these comings and goings? By determining which elements of life merited inclusion on the page (whether in a diary, chosen to record events for one’s own memories, or in a letter written with a view to what the recipient should or would like to hear about) people gave meaning and definition to their lives, chose what was important, and engaged in place-making. They created a world in their written accounts, and researchers who pry into those accounts generations later find themselves caught up in the writer’s triumphs and travails, eager observers of their affairs. Howley’s diary, like many shipboard diaries, concludes abruptly upon arrival. What happens to this bright and sometimes snarky boy? Later records reveal some elements of Howley’s adult life. By the 1880s he was permanently back in North America, shuffling between a number of parishes in Newfoundland and the United States. An undated letter between his brothers Tom and James hints at his having a drinking problem. They talk about other siblings who have shut Richard out, and Tom writes “I do not believe in treating him harshly, what’s the use of it, he can’t be accountable… the end of it will be he will be off again some day to Canada or the States or so on. It is a sad business.” Richard died in New York State in 1912. The Richard Howley in the journal comes off as endearing albeit somewhat haughty, an eager observer of the world around him, writing with wonder about porpoises, whales, and his first glimpse of Ireland. For young Richard Howley, the transatlantic crossing from St. John’s to Ireland was a threshold – he left St. John’s a boy, to train for the priesthood in his father’s homeland. For three and a half weeks he recorded his observations. Who was he between those weeks on the ship and the letters that passed between his brothers many years later? And here is where letters and diaries are at their most frustrating. The rest of the story – the family left in Newfoundland (many of whom were prolific diarists themselves), the education, praise, and turmoil that awaited him – can be fleetingly sketched. But when the ship docks, he puts his pen aside. The curtain goes down and the lights dim. The performers are no longer visible, and we are left to ponder the brief performance their words recreate. Letters and diaries are sites of self-fashioning and place-making, but for all that they reveal, there is much that remains unsaid. We can only speculate on the person and the place that existed beyond the page margins. 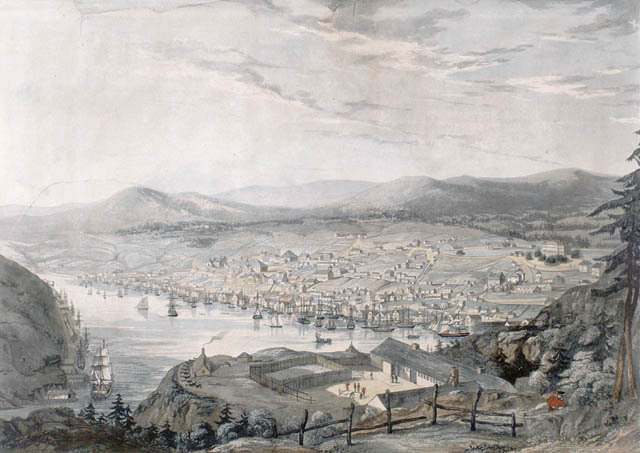 Angela Duffett is a PhD candidate at Queen’s University where she is completing a dissertation on place and landscape in 19th century St. John’s, Newfoundland. Find her on Twitter @AngelaDuffett. Richard Howley diary August 5, 1853. Memorial University of Newfoundland Archives, collection 262, file 7.01.001. For letter writing in a transatlantic context, see for example, Eve Tavor Bannet, Empire of Letters: Letter Manuals and Transatlantic Correspondence, 1688-1820 (Cambridge: Cambridge University Press, 2005); Konstantine Dierks, In My Power: Letter Writing and Communications in Early America (Philadelphia: University of Pennsylvania Press, 2009); Elizabeth Jane Errington, Emigrant Worlds and Transatlantic Communities: Migration to Upper Canada in the First Half of the Nineteenth Century (Montreal and Kingston: McGill-Queen’s University Press, 2007); David A. Gerber, Authors of Their Lives: The Personal Correspondence of British Immigrants to North America in the Nineteenth Century (New York: New York University Press, 2006); Sarah M.S. Pearsall, Atlantic Families: Lives and Letters in the Later Eighteenth Century (Oxford: Oxford University Press, 2008); Ian K. Steele, The English Atlantic 1645-1740: An Exploration of Communication and Community (Oxford: Oxford University Press, 1986). Edward Morris Diaries and Journals, March 23, 1851. Maritime History Archive (MHA), Memorial University of Newfoundland, Reels 1-3-3-(1-3). Edward Morris diary, March 4, 1851. MHA Reels 1-3-3-(1-3). Greg Dening makes a similar point in his introduction to the edited collection Through A Glass Darkly: Reflections on Personal Identity in Early America, eds. Ronald Hoffman, Mechal Sobel and Frederika J. Teute (Chapel Hill: University of North Carolina Press, 1997): 1-6. Richard Howley diary, August 6, 1853, MUN, Coll 262, file 7.01.001. Richard Howley diary, August 12, 1853. MUN, Coll 262, file 7.01.001. Tom Howley to James Howley, n.d. MUN Coll 262, file 7.01.007. 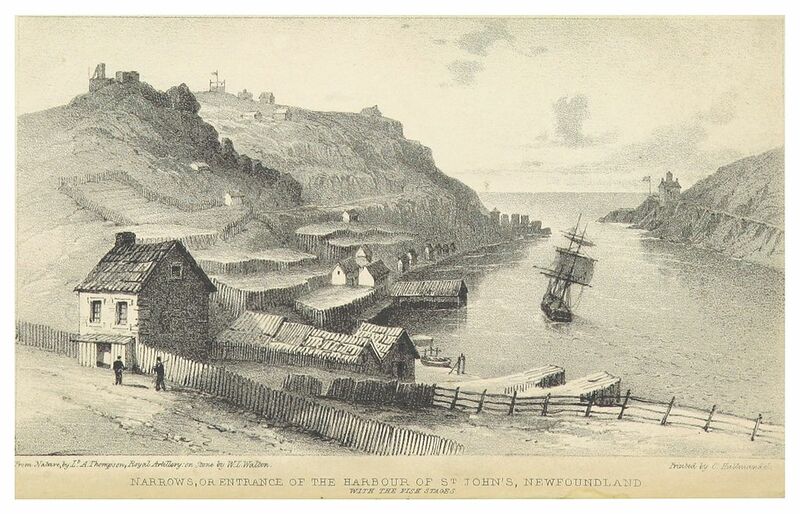 Featured Image: Entrance of the Harbour of St. John’s, Newfoundland, 1842. From Richard H. Bonnycastle, Newfoundland, in 1842 (London: Henry Colburn, 1842). British Library via Wikimedia Commons.